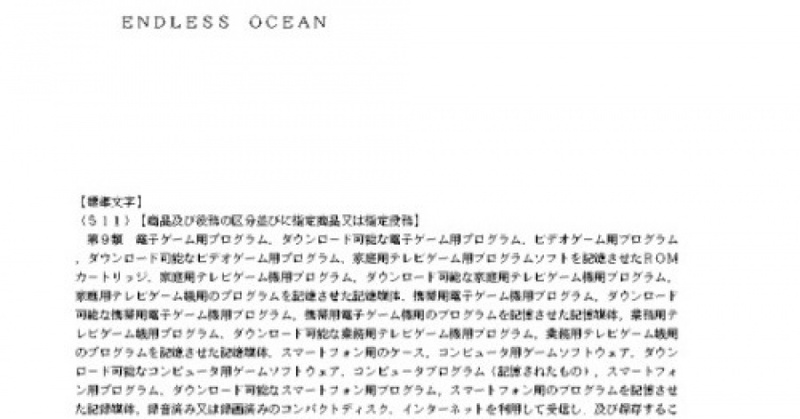 Nintendo Applies For Endless Ocean Trademark In Japan, Could This Wii Title Resurface From The Deep? Take a moment to reflect on the Nintendo Wii generation and you’ll likely remember Wii Sports, Mario Kart Wii and perhaps even Wii Fit. One title made available early on in the system's life that didn’t get as much attention was the scuba diving game Endless Ocean. Originally released in Japan as Forever Blue in 2007, it made its way across to European shores later that year, and eventually surfaced in the US a year after. 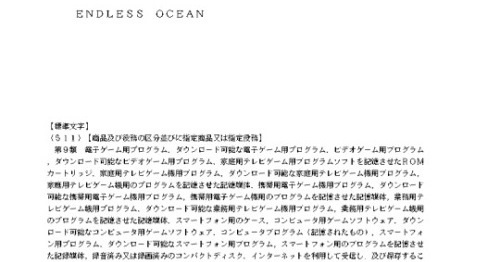 Japanese Nintendo is now reporting Nintendo has applied for an Endless Ocean trademark in Japan for purposes related to ‘video game project’. Endless Ocean was originally developed by Arika – best known in recent times for its work on the 3D Classics line on 3DS. The title was published by Nintendo and a sequel was released later on in 2009 adding online multiplayer. At the end of last month, Nintendo applied for a new Hogan’s Alley trademark in Japan. As mentioned then, it’s best to refrain from excitement when discussing trademarks in case it is just business as usual. Would you like to see the return of Endless Ocean? Did you ever own or play this game or the sequel on the Wii? Tell us below. Or they're just updating their trademarks. I honestly wish a new Endless Ocean was in the works. Enjoyable experiences. Just protecting names and such. Nothing to get excited about. Oh man... Endless Ocean, that'd be a boss thing to do with Switch. Imagine using the gyro controls to look in your own personal aquarium. I love the premise and bought the game after much hankering - and yet, got bored of it within a month. endless ocean 3 for switch confirmed !!! One of my favorite games on the Wii, particularly the sequel. To have a new entry in the series with HD visuals, and that I can play on the go would awesome! But, yeah, any excitement at this point would be premature. 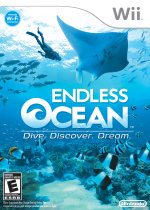 Would love a new endless ocean, my missus has played both games to 100% and replayed them several times. She would get VERY excited for a new title. fingers crossed! Endless Ocean 3 on the Switch would be awesome. @HobbitGamer Are we thinking of the same Escape From Bug Island? Because the one I have in mind doesn't make me think "better". Endless Ocean stage for Smash confirmed. I would absolutely love another entry in this series. The originals are probably the only wii titles I go out of my way to revisit. I would even be interested in having the original titles on my switch just so I could explore those environments on the go. But, Go Vacation already has Scuba Diving with almost same vibes with Endless Ocean. Can this "trademark => new game announcement" implication please stop?? Please! This would be so awesome on the Switch! I loved the Wii games. I played them to death. I just love everything to do with the ocean and sea life. YES PLEASE! I would love a third Endless Ocean. Actually I'd love to have more motion games. Just make the Switch a Wii 2.0 and I'll be happy! Endless boredom. Just my opinion of course. This is a Wii game I really enjoyed! I wouldn't mind seeing a comeback. YAY, more trademarks that likely doesn't confirmed anything! A portable HD endless ocean game? Give it to me Nintendo!! I love the ocean. I would very much enjoy a game like this. I don't care too much if a game is HD or not usually, but I didn't get this on Wii because it just wouldn't look right without proper graphics to me. Would definitely get one specifically made for the Switch, though! It’s free to wish so that’s exactly what I’m doing. I hope it happens!!!!! Please bring to Switch. Omg I wish there wouldn’t be a news article every time a trademark is renewed, it literally means nothing. Not to mention a new Endless Ocean is extremely unlikely. Neither titles surpassed 1 million sales, which over a hundred titles for the system did. Those are not impressive sales for a retail console game, especially given the size of the Wii audience and the fact that Nintendo published it (though not developed). I’m sure some people enjoyed them but they sold horribly and I doubt the developers would even consider a third entry. But yeah. Posting a news article for every trademark renewal with clickbait headlines like, “Could this series resurface?” completely contradicts the end of the article stating, “it’s best not to get excited, it could be business as usual.” More people will read the headline than the whole article and it’s a great way to start rumors. There is certainly enough news to cover on a Nintendo site, like details on the 20+ games released digitally every week. Edited for accuracy, I initially posted the sales figures for them but realized there’s no evidence it even hit those numbers. @Yosher You'd be surprised how good Endless Ocean 2 looked despite being on the Wii. I hope this is real, I love both of Arika's Endless Ocean and EverBlue. Can't wait to get back to this one. Now if only Arika would also give us Fighting EX Layer too. @ShadJV How are 1 million and 800K + sales horrible for games with mid-sized budgets? At any rate, I agree that this should not be reported. Nintendo renews trademarks for franchises that are not seeing new releases so Nintendo does not lose the IP. @roboshort sorry, edited my message, after checking VG Chartz I realized their reporting on sale numbers for this game were sketchy at best - it “passed” 1 million sales several times as they kept changing the number. I can’t find any actual evidence of their sales and it seemed to have not been posted (which tends to indicate a game underperformed)... but of the 104 Wii games that passed 1 million, these aren’t on the list. And it seems every other game published by Nintendo is, including some of their less popular titles like Wii Music. Both these games were fairly high budget though, at least for games developed outside of Nintendo for Wii. They were panned by critics and the sales numbers were never actually reported. I’d say they probably didn’t do well. @roboshort also an average of below 1 million sales per entry for a game on a system with over 101 million sales isn’t really good, in terms of Wii games it was not very successful. It certainly has its merits and having tried it, while it wasn’t my style, I could see the appeal. But the fact remains that there is no indication it even made enough of a profit to consider a sequel, given the scope of the two titles (especially the second) the game had to have had a fairly large budget too. I would bet money this series won’t resurface anytime soon. My daughter played both Endless Ocean games for years after release, and has now secured a degree place to study marine biology at university. How's that for making a life-changing impact? Awesome! I want to see the plastic and dead fish at 60fps or no deal! I'd be so happy with just a port of 2 to Switch. I truly hope for 3, but 2HD will do. I would love an HD version of both games to be released on the Switch. If they could work on the controls though. A modernized version of this series would be great. @ShadJV Hmm.. They look like games with mid-sized budgets to me, which would mean a few hundred thousand sales would probably result in a profit, though who knows how well it really sold cause VGChartz is unreliable. That said, yeah, if I were Nintendo and making the decision I'd only attempt a 3rd entry if the series had a devoted cult following (kinda like Xenoblade) or I got a really good proposal for a 3rd entry that I believed in. 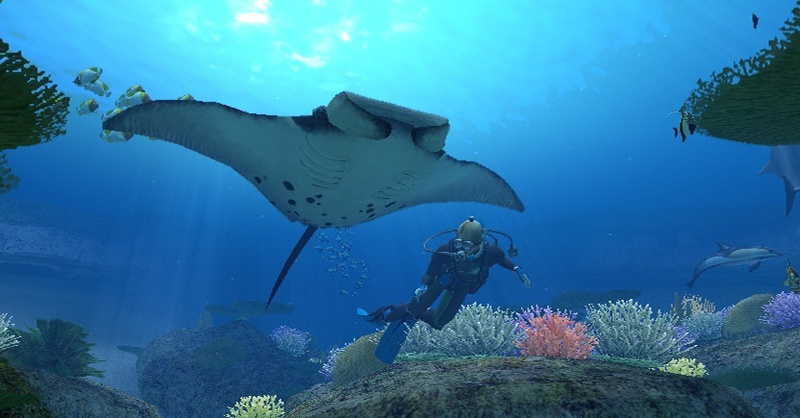 I was always very interested in the game, and good scuba diving games don't come around very often! I think I would like to see this one on Nintendo Switch! @thiswaynow That is actually a pretty awesome story! The last one was really bad. Hope they go back to a more RPG-ish story-driven exploration game. Endless Ocean Grand Prix confirmed. I loved Endless Ocean 1 and especially Endless Ocan 2. A new Endless Ocean in 1080p would look gorgeous. Oh yeah please, I'd love another Endless Ocean! Is already pre-ordered! Played both of the Wii games hundreds of hours and there's still stuff to find and do. I had a lot of fun with the original on the Wii back then. If a new game would be released for the Switch, or even a remake of the original or its sequel, I'd be very happy. I hope is a new game and not another port. I know how unlikely it is, but I’d like an Enless Ocean 3, or even a port of the other 2. As for the people severly correcting us for saying so, relax. No harm done to anyone saying we want a game that probably won’t get made. @Anti-Matter I haven’t played Go vaction, but I have seen some videos, and it may have the same vibe, but I seriously doubt the level of exploration comes anywhere close. And I’m definitely not seeing anything close to the same level of realism or attention to detail. Go Vacation have Scuba Diving too. It has 4 different level, from shallow until deep dark bottom of the sea (Looking for giant fishes could make you excited, nervous and little bit scared at the same time). There are Oarfish, Whale shark, Beluga Whale, some creepy deep sea fishes. I hope we get an updated version. it was a great game the only downside was that the graphics were sorely lacking because of the Wii's power. The switch can fix this if they completely redid the graphics and made it absolutely gorgeous. This would be so wonderful! The time I spent with the sequel, "Blue World", is the most magical experience I've ever had with a video game. Endless Ocean is a wondrous niche game. I think it definitely deserves a revival! Loved Blue World. Seeing this in HD would be unreal. I really wanted one on the Wii U, where the GamePad would have made a great map screen. The only bothersome thing on the Wii was having to constantly stop the action to check the map.